IN order to give such members of the congregation as may be desirous of communicating timely notice of this sacred work, it is customary for the server of the Mass to ring the little hand-bell each time that the priest says, “Domine non sum dignus,” just before he communicates. The people then advance to the sanctuary rails, where they take a kneeling posture, and, having placed the communion cloth immediately under their chins, await the approach of the priest. The server, in the meantime, recites in their behalf the same form of Confession that was said at the beginning of Mass, while the priest is getting ready the Sacred Particles for distribution. To this end he opens the tabernacle, and, having made a genuflection, takes therefrom the ciborium in which these Particles are kept, and places it on the corporal in front of him. He uncovers it immediately, and, having made another genuflection, turns a little towards the communicants and pronounces over them the two following prayers: 1st, “May the almighty God have mercy on you, forgive you your sins, and bring you to life everlasting.” 2d, “May the almighty and merciful God grant you pardon, absolution, and remission of your sins.” When pronouncing this form of absolution he makes the sign of the cross over all at the rails, and, having made a third genuflection, takes the ciborium in his left hand, and, holding a Particle over it with his right, says in an audible tone, “Behold the Lamb of God; behold who taketh away the sins of the world. Lord, I am not worthy that thou shouldst enter under my roof; say but the word and my soul shall be healed,” This latter protestation he pronounces three times, and then descends to the rails, where he distributes the Sacred Particles to the communicants, always beginning at the Epistle side. At this part of divine service all are on a level—rich and poor, learned and illiterate, king and peasant. All kneel together at the same rail, and, side by side, receive their Lord at the same time without any distinction of ceremony by reason of rank or title; and so careful is the Church of the reputation of her children that she forbids the priest to pass any one by at the rails, no matter how unworthy that person be, provided his criminality is secret; thus imitating that singular charity of her Divine Founder, who allowed Judas to communicate at the Last Supper, although he knew that he would soon betray him. In administering the Blessed Particle to each person the priest says, “May the Body of our Lord Jesus Christ preserve your soul unto life everlasting. Amen.” Unless in danger of death, Holy Communion must be always received fasting. 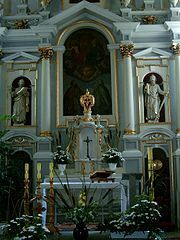 Having communicated all, the priest returns to the altar and encloses the ciborium in the tabernacle with the customary genuflections. He then holds out the chalice to the server, and receives about as much wine in it for the ablution as was first put into it for consecration. While doing this he says: “What we have taken with our mouth, O Lord! may we receive with pure mind; and from being a temporal gift may it become for us an eternal remedy.” The Holy Eucharist is here called “a temporal gift,” inasmuch as received here below by wayfaring men. It is denominated “an eternal remedy” in accordance with what our Lord himself says of it: “If any man eat this Bread he shall live for ever.” The wine is taken into the chalice in order to purify it from all traces of the Precious Blood, and is drunk by the priest instead of being thrown into the sacrarium, as was the custom in early times (Bona, p. 371). Having drunk this first ablution, the priest takes the chalice with both hands, and proceeds to the Epistle corner of the altar to receive the second ablution from the server, consisting of wine and water, which he allows to fall into the chalice through the tips of the thumb and index finger of each hand held over the chalice’s mouth, and this to purify them from any particles of the sacred Host that may have adhered to them. He drinks this second ablution also; and having then purified the chalice with the purificator—instead of which the Greeks use a sponge—arranges it in the centre of the altar, putting all that belongs to it in the proper places.